Last Friday I went to the opening of this exhibit. To be honest, at first I thought it was just the same old multi-media stuff meant to play with light, image, motion and time and I was bored. Then I overheard the artist, Peter Traub, explaining all the elements involved in the installation including sound, temperature, film, light, etc combined with distance, time and in-space elements and my small little judgmental jaded mind expanded like the Grinch’s heart on Christmas Day and I thought, “Holy Cow! This is actually quite impressive and cool.” In short, I urge you to make an effort to see this exhibit and read about what it all is so you can appreciate how utterly complex and timely it is- a creative, expressive marriage of technology and art. 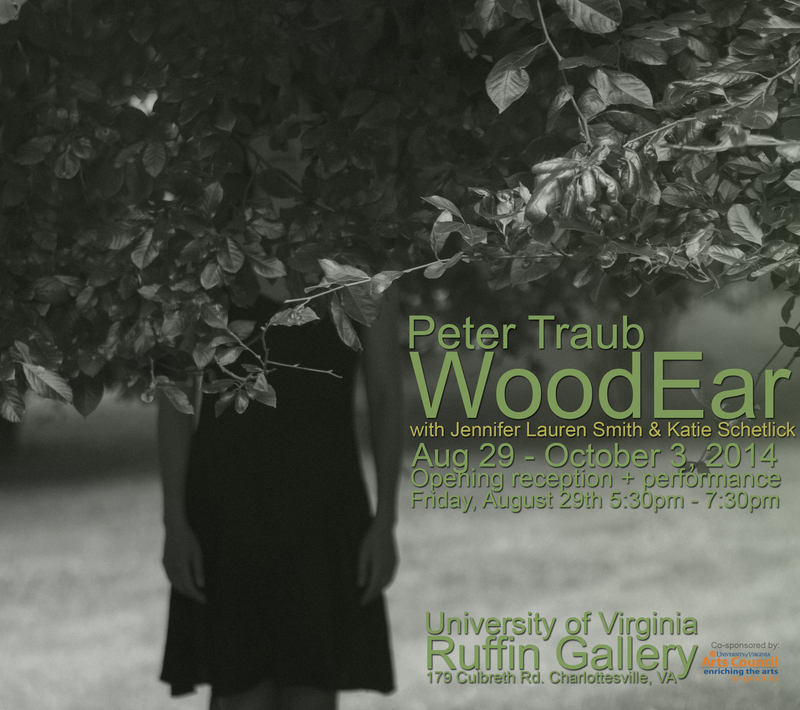 I am very excited to announce that a large scale solo exhibit of my piece,WoodEar, will show at Ruffin Gallery from August 29th to October 3rd, 2014. 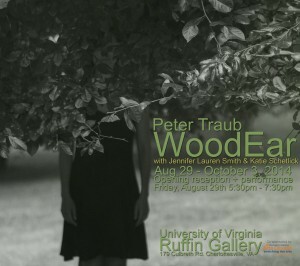 The August 29th opening, which will run on a Final Friday from 5:30 – 7:30, will include live choreography with multiple dancers directed by UVa ChoreographerKatie Schetlick. The installation will also include new digital and fixed media pieces with significant contributions by my collaborator, New York-based sculptor and video artist, Jennifer Lauren Smith. The piece will present several large-scale projections in the darkened gallery space, surrounded by 4.1 channels of live sound. WoodEar was funded with a very generous grant from the UVa Arts Council, which enabled me bring in Jennifer and Katie to collaborate, as well as to purchase a significant amount of technical gear to re-imagine the piece at its largest scale to date. The Final Friday event is open to the public and will include free hors d’oeuvres and drinks. For a link to Traub’s website click here.